Our small, comfortable communities offer the individualized care you need, with all the luxurious, enriching amenities you deserve. Get the personal attention you need in a comfortable, compassionate environment you’ll love. Our highly trained staff specializes in providing care for those living with cognitive disorders. Explore the many activities, amenities, and care services that enrich the lives of our residents. Learn more about what our community has to offer. At Angelica’s Place, we treat our residents like they’re part of our family. We provide the highest level of care possible, so you can be confident that you or your loved one will always be comfortable, happy, and healthy. We pride ourselves on providing a personal and loving environment where all residents are treated with respect, courtesy and dignity at all times. Living at Angelica’s Place, you’ll get the personal care you need, while always feeling right at home. Our facilities are small enough to provide attentive, individualized care to each of our residents, but we also provide the same quality amenities and activities that you would expect from a larger facility, such as a State Licensed Occupational Therapist as our activity director, recreation room, arts and crafts room, beauty shop, living room, therapy room, game room, library, outdoor recreation area, and more! 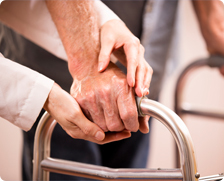 At Angelica’s Place we go the extra mile to ensure the proper health and care of our residents. One example is our hydration program, which ensures, through proper monitoring, that each of our residents stays hydrated with clean, fresh drinking water throughout the day. Thank you to the entire staff at Angelica’s Place for the loving care, kindness, and concern you shared with Peter. It helps us to know he was being well cared for and taken care of when we were unable to be with him. God bless you all! Mary P.
Just wanted to take a moment to thank you and your staff for the tender, loving care you gave to our 100-year old mother, Marge. We know it was the kindness, care, and attention you and your staff gave Marge that made her want to go 'back home'. Linda J.
I always get the personal attention I need, when I need it, but I also enjoy my privacy. It’s such a blessing to have my family close by. The staff is very friendly and everything is always very clean and organized, which is why I am always comfortable calling Angelica's Place my home. Marge S.